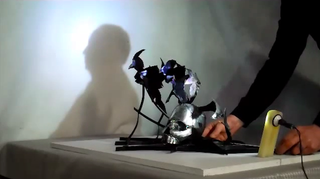 By itself, Jeff Asper's junk sculpture looks like a flock of birds welded flying over a spiderweb and a human skull. But when you light it from just the right angle, it casts a familiar shadow. Asper has made a number of other shadow sculptures, including The Thinker made from Playstations and a series of bolts that create a mewling cat. The elements of horror (especially those menacing birds) are an especially perfect fit for the master of suspense, whose silhouette graced TV sets for years.